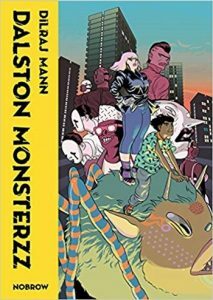 Dalston Monsterzz by Dilraj Mann. Nobrow, 2017. 9781910620359. 76pp. I’ve been following library comic since you first started. I’m mostly enjoying the changes lately, but I am quite disappointed that of the 11 author/illustrators you have profiled in your graphic novel reviews, only ONE has been a woman, and I think all have been white. I have followed library comic so diligently because it has mostly had very good politics and intersectional analysis. There are amazing women, gender queer and folks of colour making comics and graphic novels. Please do better in representing this in your graphic novel reviews.